Soil nails are a cost effective method for long or short term stabilisation of steep existing or proposed slopes. The stability of the slope is increased with the installation of steel or glass fibre threaded soil nails placed into pre-bored holes or simultaneous drilling and installation techniques. The end results along with the correct drainage significantly reduce the chances of a landslide or other ground movements. Whether it’s for roadway cut excavations, slope stabilisation or retaining wall support, soil nails are a versatile and practical form of earth retention used to prevent horizontal movement. Nail location, inclination, and lengths can be adjusted easily when obstructions (cobbles or boulders, piles or underground utilities) are encountered. Main contractor McLaughlin & Harvey Construction Ltd awarded Aarsleff Ground Engineering the contract to supply and install a soil nailed wall to support the construction of a new IKEA store in Exeter, just off Newcourt Way near Sandy Park. Soil nailing has the benefit of a top-down construction method and therefore was deemed to be the smartest solution to allow the development to progress without significant loss of usable land. The land, which is 115,882.00sq metres in length, was bound to the South by a residential construction site and existing residential development. To provide a level platform on which to construct the new IKEA store, Aarsleff cut into an existing slope 424m long and 9.8m high. Testing was carried out in advance of the main works to include the install and test of 6 No test nails between 5m and 8m long. Aarsleff then installed 1081no 32mm hollow self-drilling soil nails with a sacrificial drill bit to a 70° slope made up of Dawlish Sandstone, faced with a structural steel mesh cladded with a facing mesh and filled with a graded hardwearing local stone. 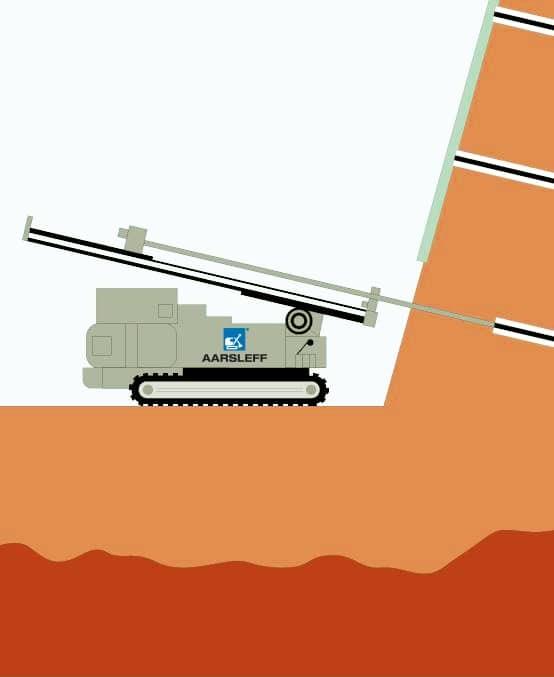 The nails were installed with Aarsleff’s own Klemm 806 drill rig.